It's inevitable. We seem to be conditioned to formulate opinions based on first impressions. But is that wrong? I guess when it comes to dating, there are two first impressions involved. The first is someone's profile on a dating website (assuming you're on a site since it's a popular way to meet people). Dating websites are filled with hopeful singles that have profiles that run the gamut... and its best that you take what those profiles say with a grain of salt. The second is the first date (assuming things go well after the preliminary profile screening). There was one person who was interested in getting to know me better a few months ago. He was very nice and we chatted for a couple of weeks before I agreed to meet for dinner. In my mind, I pictured the very same person reflected in his profile. But on the date, I think the guy's dad showed up instead. Um, talk about awkward. Needless to say there wasn't any love connection and I think that specific date was the shortest one yet - 1 hour from the time I walked into the restaurant and got back into my car when it was over. I went in, ordered my salad, finished my salad, made small talk in between and politely thanked him for dinner. I felt a little deceived about the whole thing but I guess that means I need to do a better job clarifying ages and asking the potential date if his picture is recent. Lesson learned. A lasagna isn't a dish that necessarily is popular in the summer. Since it's a comfort food, many tend to enjoy this dish in the cooler months. However, this particular lasagna is perfect for the summer. Using seasonal ingredients like zucchini and fresh corn (although, I used canned this time around), it could very well be a summer lasagna. It freezes well and this is a lasagna dish that can easily be made vegetarian by omitting the chicken. Melt 2 tablespoons butter in a medium, heavy saucepan over medium heat. Add half the garlic and saute for 1 minute. Mix in the 1 1/2 cups of corn and saute for 5 minutes. Stir in the cream and thyme; allow to simmer for 5 minutes for the flavors to meld. Remove the corn from the heat and allow to cool slightly. Transfer the corn to a blender and puree until smooth or use an immersion blender in the pot to puree until smooth. Season with salt and pepper to your tastes. Heat the remaining 2 tablespoons butter in a small, heavy skillet over medium heat. Add the onions and saute until translucent, about 5 minutes. Add the remaining garlic and cook for 1 minute. Mix in the zucchini, poblano strips and bell peppers and cook for 5 minutes for the flavors to incorporate. Add the cooked chicken and season with salt and pepper; remove from heat. 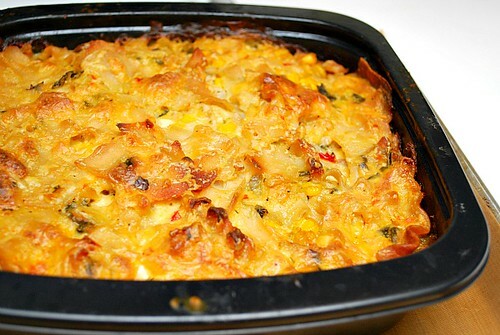 Spread about 1/4 of the corn mixture over the bottom of an 11 by 8-inch baking dish. Cover with a layer of 3 lasagna sheets. Spread 1/4 of the poblano and chicken mixture and 1/4 of the cheese over the pasta. Repeat the layering 3 more times. Cover with foil. Where does the chicken enter into this dish? Hmm... 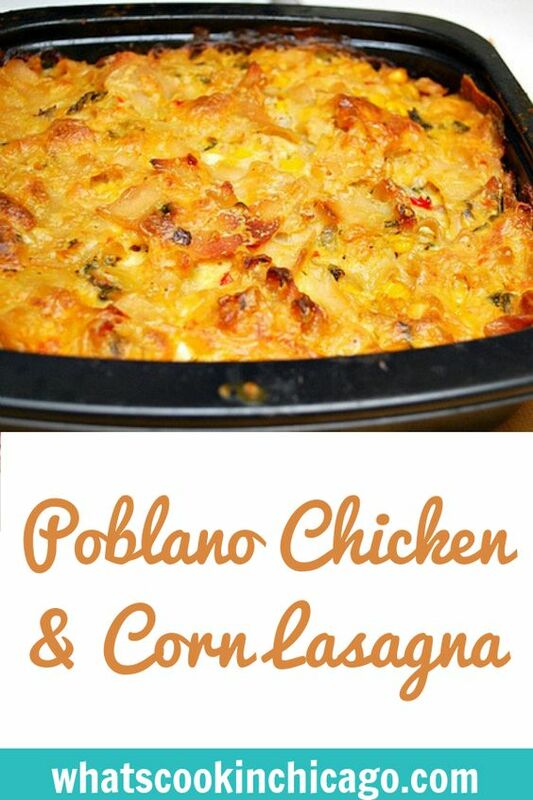 I wonder why I could never succeed making this chicken and corn lasagna..